Rows of designer glasses, highlighted against the store’s pristine white walls, line the walls of the boutique. Photo by Casey Dunn. Tape lights help transform the storefront into a billboard, a stark contrast to the dark facades of the neighboring shops. Photo by Casey Dunn. Concrete floors, marble counters, and Venetian plaster walls elevate the spare material palette. Photo by Casey Dunn. 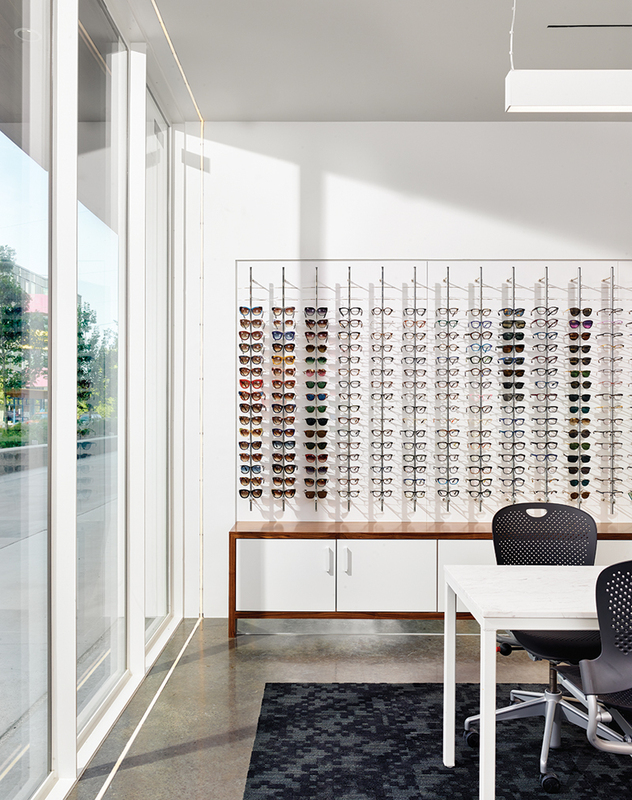 Austin is the fabled home of musicians, creative types, assorted hangers-on, and a seemingly unending number of high-end glasses boutiques to supply them with the requisite artistic eyewear. 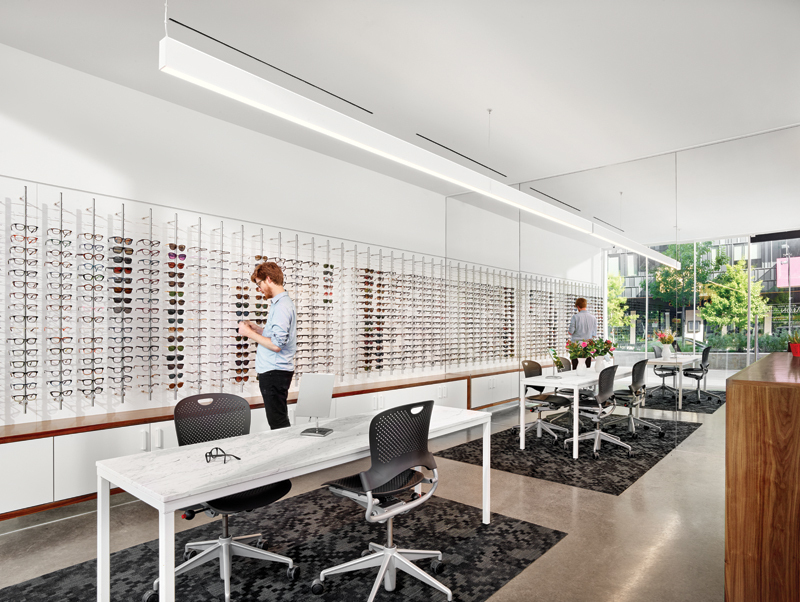 Optique, an independent, family-owned optometrist’s office, has two locations less than two miles apart on Lamar Boulevard: a larger office at the Seaholm Power Plant development, and a 1,067-sf storefront at Lamar Union. Each is bright and modern, and distinguished by candy dishes filled with treats that shoppers can serve themselves using miniature wooden spoons. The walls are lined with a curated selection of decidedly high-end sculptural frames. The architects’ process for the project was quick, with a mere two weeks needed to produce drawings and renderings. Simplicity was key in preventing the space from being overwhelmed by the architectural installation. Complicating matters was the fact that the architects had to accommodate two examination rooms in addition to the boutique component. They hid the rooms, as well as additional storage, at the back of the store, tucked on either side of a narrow, wallpapered hallway. Situated among Lamar Union’s black, steel, and Ipe-clad facades, Baldridge wanted Optique to stand out. The shining white storefront glows brightly, like a chic spaceship, aided by tape lights that line the window in a shining halo. It functions much like a sign, itself, beckoning passersby to stop in. After all, it is a fact universally known that it is impossible to try on just one pair of glasses. But the main architectural feature of the space is the enormous mirror that covers the back wall. It performs an adept sleight-of-hand, creating the illusion that the interior is twice as big as it actually is, and reflecting Lamar Union’s courtyard back on itself. The material palette — chiefly marble and Venetian plaster by Sloan Houser — contributes to the jewel-box-like atmosphere. Patrons might linger for only a few minutes, trying on a few pairs of glasses before catching a movie at the nearby Alamo Drafthouse, but the experience is designed to be memorable. “You need to be able to read this immediately — in one gesture,” Baldridge says. 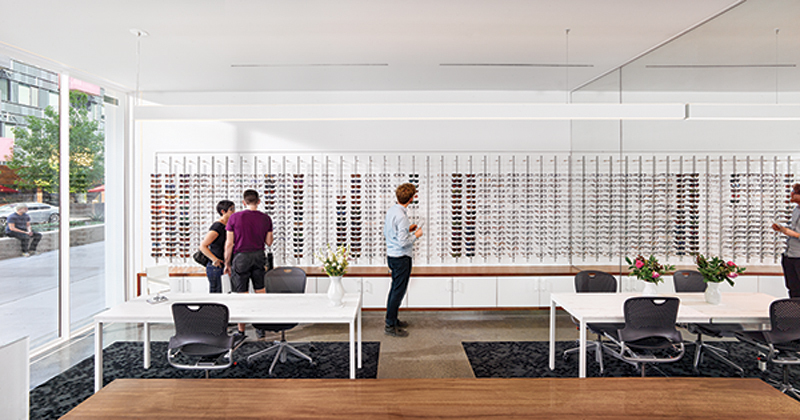 Optique is selling an aspirational vision, reflecting back infinite possibilities. The glossy surface pairs perfectly with the stylish glasses, themselves signifiers of a particular kind of identity. The store’s blank canvas invites transformation. Picture yourself, the mirror says, a new person. Alyssa Morris is web editor of Texas Architect. She wears glasses.